Samoa’s Regulator, Donnie De Freitas is on fire to introduce an IXP into Samoa. The OOTR recently hosted a one and a half day event introducing the idea and sought a mandate from attendees to push through with the idea. He has South Pacific precedent with Vanuatu successfully implementing an IXP and says that he has the support of an ‘alphabet soup’ of acronymed organisations. Here’s a brief wrap-up of the first day and my take on it all. An IXP is . . .
An IXP is basically a local installation of routers and servers that retains a cache (memory) of commonly viewed websites. 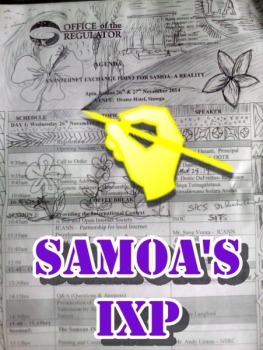 Imagine people connecting to each other within Samoa, rather than via an offshore service; and copies of Google and YouTube locally in Samoa rather than in the USA. Participants in the IXP programme will benefit from faster and cheaper Internet costs as the traffic to and from (for example) YouTube will be reduced to local traffic only, instead of heading offshore. Vast speed improvements and substantial reduction in international bandwidth costs are the two USPs. The first will be benefiting the Internet users, the second is one that will benefit the two primary ISPs and potentially (if they pass their savings down) their clients [us users]. Installation of a Google Cache could improve an ISX as in the example of Vanuatu. The Office Of The Regulator has a responsibility to manage Internet-related matters and an IXP is certainly a good idea on the surface. 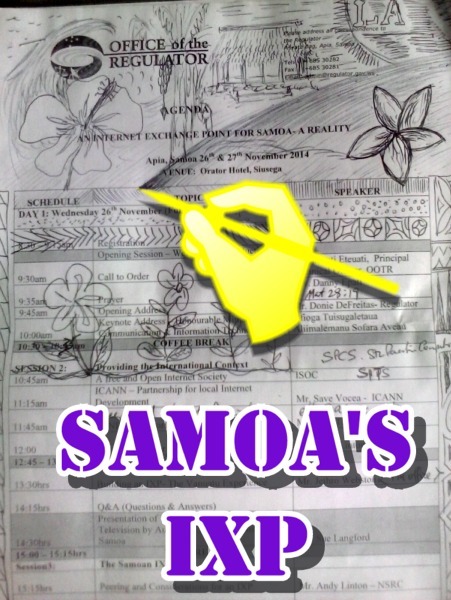 Donnie’s intent to garner support from a people largely disconnected from the business world and ICT matters to drive and manage the initiative will likely fall flat in Samoa, where people tend to only ever do what they are told to do, thus pretty much only do what they have to. He will need to lead from the front and tell people what they will get and should do (and then they will if there is something in it for them). He’ll need also to get real buy-in from the ISPs first, and then help the larger companies and universities to utilise the services. His commitment to getting an IXP up and running is admirable. If he can do something with the wholesale cost of bandwidth with the new submarine cable to Samoa about to be announced, then good on him! The workshops in the afternoon started to develop some ideas of where-to-from-here under the leadership of an Andy Linton a retired lecturer from Victoria University in Wellignton and a guy passionate to help improve Internet services around the region. Donnie explored ways that local content could be developed following cheaper/faster Internet based on local services – media, universities and User-Generated Content as better services apparently contributes to more content – logically. In Samoa that will just mean more YouTube and Facebook data! PNG tried to do something with an IXP but this failed or didn’t gain traction. Fiji is looking at an IXP too. As an aside I chuckled with the engagement of a Pastor and the obligatory opening prayers prior to the event, considering that the Regulator and another key industry player sitting beside me do not share the Christian belief and let it be known! As I don’t attend church myself, that made it three people that I knew who didn’t buy-in to the Churchianity thing. Cultural norms really are funny when they are challenged. It’s like a big elephant in the room! I couldn’t work out a coherent message from the short speech/prayer. Danny Epati from Saanapu was the man on the spot who referenced Matthew 28:19 [Go make disciples], spoke about Jesus’ need for us to work together (I thought He talked more about a relationship with the Father and obedience to Him, but there you go!) and prayed for us to grow in strength and wisdom through the use of “hopefully a little cheaper” Internet communications. For the record, I invited myself to the event based on a public media release that called for as wide a representation of stakeholders as possible: Source. The event was held at the Orator Hotel and the [distinctly Palagi] food that was served up was a pleasant change for a . . . well . . . Palagi! Good luck putting the two biggest stakeholders Bluesky and Digicel together to get agreement . . . again! Note: I was only able to attend the first day. Revisionism has been most frequently and effectively applied to correcting the historical record relative to wars, because truth is always the first war casualty, the emotional disturbances and distortions in historical writing are greatest in wartime.